It happens all the time – a customer has a problem that’s tough to solve. I was recently asked how to best protect a virtual environment – stretched between two data centers. The customer wanted all administration through vCenter with instant recovery and the ability to meet stringent RPOs and RTOs. And the catch – they wanted the backed up data to be stored on a different vendor’s array utilizing a different protocol - NFS instead of Fibre Channel (FC) block storage. After doing my due diligence and consulting with my Daymark colleagues I determined that something familiar – yet new – would be one good answer for them. That “something” was EMC RecoverPoint for Virtual Machines. RecoverPoint has been a staple of the EMC data protection family for many years with over 250 million run hours in the marketplace. The newest member of this family is the hypervisor-based RecoverPoint for Virtual Machines (RP4VM) which became generally available on November 17, 2014. If you are not familiar with RecoverPoint – it is appliance based replication that offers an any-point-in-time recovery model - imagine a DVR for your data. You can roll backward and forward until you find the point you would like to recover from. Traditional RecoverPoint uses physical 1U appliances that monitor block based LUNS from a storage array via a “write splitter” (more on that below) to replicate writes to either a local copy to appliances on the target site, or to a remote copy. RP4VM uses virtual appliances that are deployed as virtual machines to your virtual infrastructure. All management is built into vCenter for a quick learning curve and familiarity. the point you would like to recover from." If you are not familiar with the write-splitter from RecoverPoint technologies, it is a technology which simply copies each write coming into the storage and then sends one copy to the original destination and the second copy to RecoverPoint. The RecoverPoint copy then goes to a local copy or a remote copy, depending on the protection configured for that Virtual Machine. The major development in this version is that the RecoverPoint write-splitter – which traditionally resided in the storage array – can now be embedded in the vSphere hypervisor. 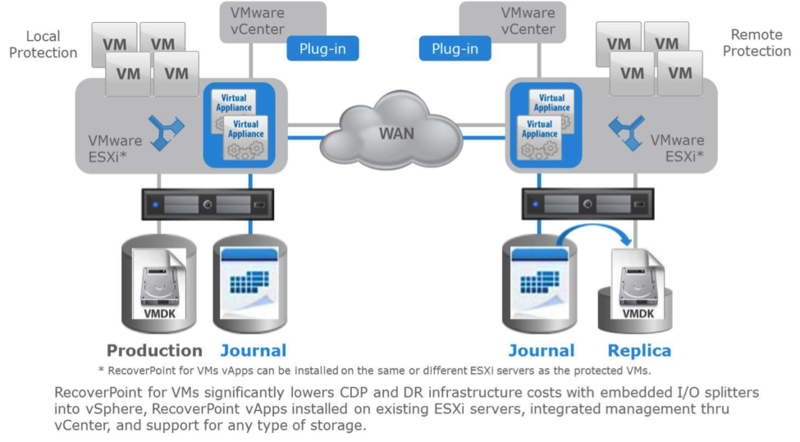 The embedded write-splitter allows for greater flexibility within vSphere and supports features such as vMotion, as well as an agnostic storage support list including FC SAN, NAS, DAS, FCoE, iSCSI, etc… As long as the storage is in the VMware Hardware Compatibility List, it is supported. 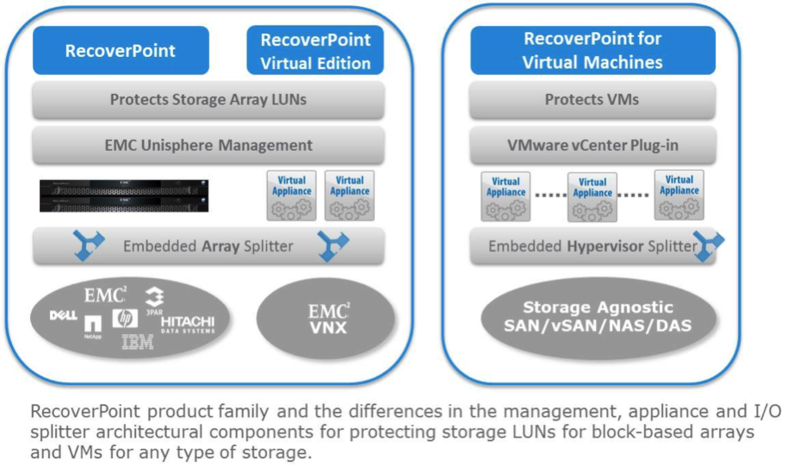 A second major change with RecoverPoint for Virtual Machines is the protection granularity. Other versions of RecoverPoint have protected at the LUN level – all or nothing. Due to the hypervisor integration, RP4VM replicates at the virtual disk level. This allows for greater flexibility in your disaster recovery strategy than a traditional LUN/Array based replication model. You can protect and recover any number of virtual machines that make up an application as consistency group regardless of which datastore (block or NFS) or even storage array for that matter. Each consistency group can be protected to a different target location and restored independently of each other. What this gives you is the ability to place your virtual machines on the correct storage tier and still maintain application write order fidelity and recoverability across all VMs that make up that application. disaster recovery strategy than a traditional LUN/Array based replication model." For my customer’s use case it was a great fit. No more physical appliances and it scales up when they scale up. It allows the NAS to SAN flexibility they needed and it is fully integrated into vCenter for management, monitoring, and even mock DR tests if they so desire. It takes just seconds to spin up a replica and grab a file if needed and restoration of any point in time is the key. The video below shows the ease of use within vCenter utilizing an EMC XtremIO storage array. I was so pleased that this new solution is going to meet all of my customer’s requirements. They’re happy with the new functionality and even happier that it didn’t require a lot of training or disruption to their data center. If you have any questions about RecoverPoint or have a similar problem you’d like to send my way, feel free to use the comments section below and I’ll be sure to reply. 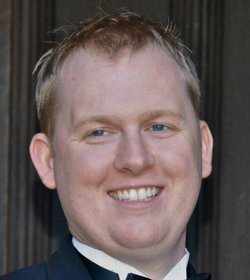 Jake Roczniak is a Senior Consultant at Daymark Solutions and specializes in storage, replication, disaster recovery, performance, and virtualization. Jake holds a BS in Management Information Systems from WPI and certifications from VMware, EMC, and NetApp.